2017 has been the year of the books. I cannot get enough. I find that I go through phases when it comes to reading and this has been my year. Call it a good season for publishing. Traveling and bed time are my two favorite times to read. There is nothing worse than getting stuck in the airport with little or nothing to do. I know what you're all thinking, gosh I hope this girl has a kindle. Yes, I do... but there is something about physically holding a book that gives me all the joy. Sure, a kindle is great, much easier to travel with and you can even get one of those handy kindle lights, but I just don't enjoy it as much. Wanna check out some other reading lists? I've got them. You can find them here and here. Paulo Coelho // The Alchemist: My girlfriend gave me this book in a time in my life when I really needed to find my way and my place. I read this book in like 2 days. It was a quick read and so good. Plus, its a classic. Anna Kendrick // Scrappy Little Nobody: Funny, quick read and made me even more obsessed with Anna Kendrick. This book details funny stories in her life but it also an honest take at her life. Amy Schumer // The Girl with the Lower Back Tattoo: This book is an easy, hilarious read about Amy and her life. Its hilarious, dirty and will actually make you laugh out loud. Bill O'Reilly // Killing Patton: Not by usual style, but I couldn't put this book down. I took this one off Adam's bookshelf and I'm gonna have to start trusting his taste from now on! Its focus is on how Patton died and the mystery around it. I am not a history buff an had no idea his death was suspicious. This book was great. Elin Hilderbrand // The Identicals: If you know me at all, you know how much I love Elin. Her books are based in Nantucket which is why I am currently planning my trip there. This book per usual took me all of 5 days to get through. I couldn't put it down. It was a little different than her other books because it takes place in both Nantucket and Martha's Vineyard. It was so good. Jane Corry // My Husbands Wife: This book was hard to get in to. I could tell this book was going to be great, so I'm glad I forced myself to get through the first few chapters. Once, I did, I was absolutely hooked. I couldn't stop. The twists in this book are insane and had me wondering what was going to happen until the very last page. 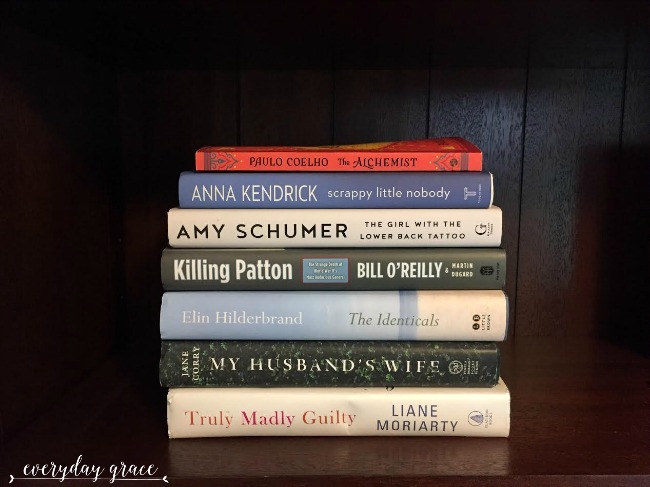 Liane Moriarty // Truly Madly Guilty: Liane is another cult-following author for me. Just like Elin, I love her books. This book held my attention the entire time because it starts with you knowing something horrible and sad happens, but you don't know what that even is. It's not until more than half way through the book that you find out what the event is. What are you reading? Tell me everything. I'm always looking for new reads. Send me your recs! So many good books here! A lot are on my to read list as well. I am adding ALL these to my reading list! Such a great round up! A few of these are on my to read list!! I loved Scrappy Little Nobody. It was so funny and relatable. My favorite line, "I'm incredibly well liked. Anyone who tells you otherwise is just frightened by their love for me." I love reading. It's something I want my kids to love to. In your list I think Amy's would be a good choice for me. I loved Scrappy Little Nobody! I haven't read The Identicals or Truly Madly Guilty yet, but I love both of those authors so I need to check them out!